Luton midfielder Pelly-Ruddock Mpanzu has been nominated for the League Two Goal of the Month award after his stunning strike against Crewe Alexandra. 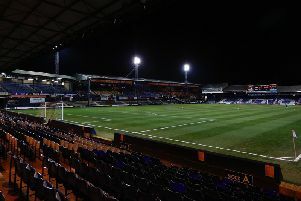 The 24-year-old blasted into the top corner after Alan Sheehan’s corner fell to him 25 yards, netting his first of the season in some style as he made it 3-1 to the Hatters. Mpanzu is up against Danny Newton’s strike for Stevenage against Barnet and Padraig Amond’s effort in Newport County’s clash with Swindon Town. The winners of the Sky Bet EFL Goals of the Month are chosen by a fan poll on skysports.com and will be announced next Friday.